NEWPORT BEACH, Calif. — A real estate developer in Southern California has removed a billboard containing a Bible and preaching imagery from outside a shopping mall after reportedly receiving a number of complaints, as well as a threat, in objection to the religious nature of the sign. 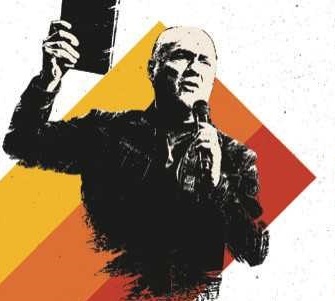 Harvest Christian Fellowship, led by Greg Laurie, had recently contacted the Irvine Company, which owns the upscale Newport Beach shopping mall known as Fashion Island, to advertise for the upcoming annual Harvest Crusade. Irvine Company is owned by Howard Bren, an Episcopalian who is stated to be the richest real estate developer in the United States. The advertisement simply read “SoCal Harvest, Greg Laurie” and included the date, location, names of musicians appearing and the web address for the event. It also featured an image of Laurie raising a Bible in the air while preaching into a microphone. However, the Irvine Company soon contacted the Harvest Crusade to advise that there had been multiple complaints and even a threat over the advertisement, which was featured on a billboard near the parking garage. A smaller banner was also displayed at the Irvine Spectrum shopping center. According to reports, the Irvine Company requested that the advertisements be altered, and Laurie’s staff complied, sending a revised design that did not include the Bible in the graphic. The Irvine Company, however, decided to take the billboard and banner down altogether and refund Harvest’s money. “We changed it to a more simplified ad that simply said ‘Harvest,’ giving the dates and some of the musical artists that are going to be with us. Then they came back and said they just wanted the ads completely removed and they refunded us,” event Executive Director John Collins told CBN News. “The thing that goes through my mind, at least, is it’s kind of an indicator of where we are culturally,” he also remarked to The Orange County Register. “If you look closely at the book I am holding up, it does not say ‘Bible.’ There is no cross on it. Yet, the image of someone holding a book up is now offensive to some. (It is indeed a Bible. ),” he wrote. “Everybody needs to just relax a little bit. I see images on billboards and displays in stores that I find offensive all the time. I do not complain or boycott. I just think as Christians we ought to have ‘equal time’ and a voice in the marketplace,” Laurie stated. Calls to Irvine Company for a response were unsuccessful.